For years, there have been a number of differing arguments over what should be put on chips. There are a variety of sauces and toppings. 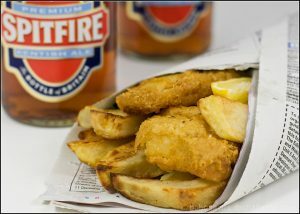 Some are supplied by chip shops, whereas others have to be bought at a supermarket. Some of the more niche and unique condiments are made at home. The classic go-to sauce for chips. Heinz has cemented itself as the most widely used brand for ketchup. However their are many own brands in supermarkets and people can easily make it at home. Cheesy chips is an option that can be found in an increasing number of British chip shops. It is a delicious choice for many. Mayo is like ketchup, one of the most popular sauces eaten in Britain. Some people even enjoy mixing the two together. This sauce is most popular in the north of England and in Scotland. Bisto is the number one brand for gravy. It is an option more commonly found in a household than actually sold in a chip shop. A more acquired taste than the other condiments on this list. Colman’s is Britain’s most well known brand of mustard. They supply it to people all over the world. When in a chip shop you are more than likely to see a mustard bottle for chips. Some love it and some don’t. This is the option that practically every single chip shop in Britain will supply to customers. It is usually free of charge. A common UK custom is for the customer to pour the salt and vinegar on themselves, so that they have as much or as little as they want. This is because everyone has their own personal tastes and the wrong amount can ruin their meal.